Please refer to our stock # EMT113 when inquiring. This is a very finely embroidered baby carrier from LiPing region. 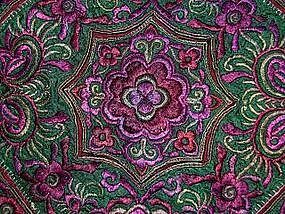 Threads of green and purple silk are used in satin embroidery stitches which are so heavy and so finely done that they almost totally cover the hand-loomed fabric. Additional decorative elements include border areas banded with tiny triangular folded fabric and hand-loomed bands.The upper portion of the carrier would be used to protect the baby's head from the elements. The 3 tassles indicated either that the mother has 3 children or that the grandmother hopes for 3 grandchildren. This carrier is in excellent condition and is 60+ years old.